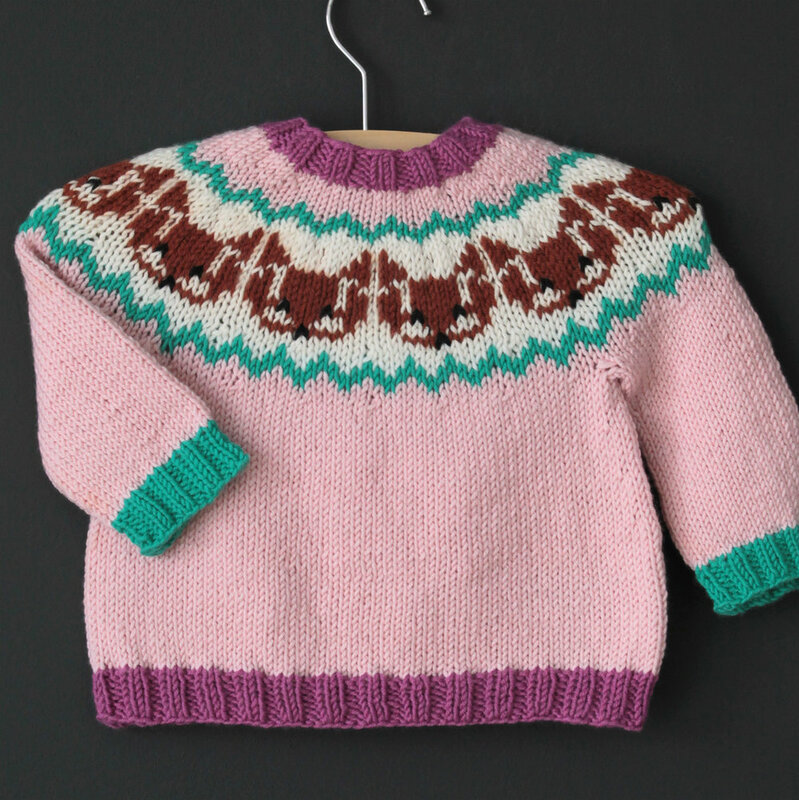 Thoughtful knits inspired by childhood memories. Exploring the world wrapped in love. Skills required: Casting on, knitting, purling, increasing, knitting in the round, working a stranded colorwork pattern in the round following a chart, picking up stitches, binding off. 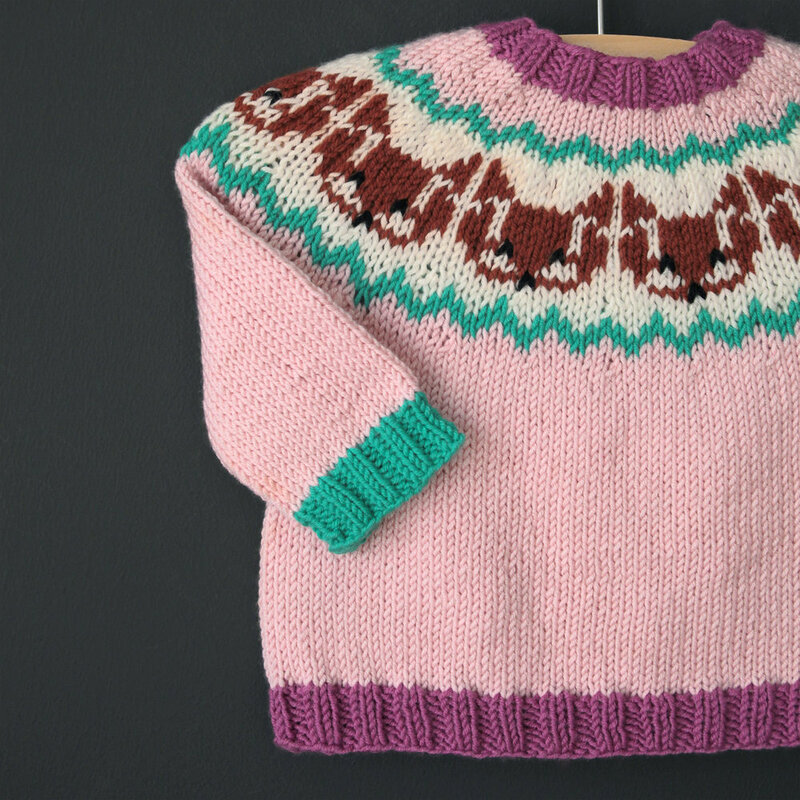 Construction: This garment is knit seamlessly from the top down, featuring a stranded colorwork section around the yoke. The pattern gives the option to work a few short rows at the back neck for a more fitted neckline (this step is optional). The yoke is worked in the round to the underarms, then the sleeves are put on hold, and the body is worked in the round to the hem. Lastly, the sleeve stitches are returned to the needles and worked in the round to the cuff. The eyes and noses of the foxes are worked in duplicate stitch (link to tutorial provided). Everyone loves foxes! Smart and cute, they are a great motif to make the perfect comfy everyday sweater extra special. A truly unisex design, this top-down, seamless sweater is a fun knit. Your choice of colors will make it as modern or as classic as you want, and as girly or as boyish as you want as well. The individual pattern is available for purchase in pdf format for 5.75 Euros. To fit chest: 16 (17, 18, 19 // 21, 23, 25, 26.5) inches or 40.5 (43, 45.5, 48.5 // 53.5, 58.5, 63.5, 67.5) cm. Garment chest: 17.25 (18.75, 19.25, 20.75 // 23.25, 25.25, 27.25, 28.75) inches or 44 (47.5, 49, 52.5 // 59, 64, 69, 73) cm. Note on sizing: age labels are provided as a reference but each child is different, so please be sure to select a size based on child’s actual chest measurement or desired garment measurement. When in doubt, I recommend selecting a larger size. Main Color: Approximately 200 (225, 250, 275 // 350, 450, 550, 650) yds or 183 (206, 229, 251 // 320, 411, 503, 594) meters of Debbie Bliss Baby Cashmerino Colorway Baby Pink (34601) (55% Wool, 33% Microfiber, 12% Cashmere ; 137yd/125m per 50g/1.76oz ball) or similar sport weight yarn. For eyes/noses: A few yards/meters of Debbie Bliss Baby Cashmerino in Colorway Black (340300) or similar sport weight yarn. US 4 or 3.5 mm circular needle (or 1 size smaller than above) of the same length for bottom ribbing. 24 sts x 32 rows = 4 inches or 10cm in stockinette stitch in the round after blocking using larger needle. 24 sts x 28 rows = 4 inches or 10cm in main colorwork pattern in the round after blocking using larger needle. Please adjust your needle size if needed to achieve gauge.